Ed Garvey, one of my heroes, all time good guys from Wisconsin and a true Gamechanger, passed away in early 2017. Garvey, was what a true progressive should aspire to be. He did not talk about change, he worked to actually change the political landscape. One of the gifts that Mr. Garvey gave us was Fighting Bob Fest. 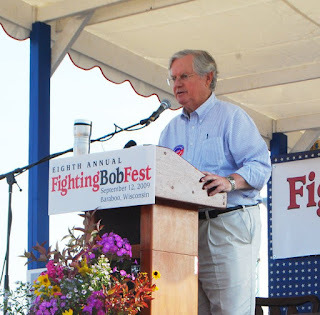 Fighting Bob Fest, was a big top Progressive Chautauqua, that was the envy of Progressives all over the country. It brought people such as Bernie Sanders, Greg Palast, Dave Zirin, Jim Hightower, Robert Kennedy Jr, Keith Ellison, etc.... to Baraboo,WI. One of the criticisms of FightingBobfest was that it was preaching to the choir. However, as we have found out, Progressives becoming a rarity in WI, we needed one day of choir practice since we have 364 days of the exact opposite. The 2016, FightingBobfest ended its run. It moved from Baraboo to Madison and now it goes into the dust bin of history. There will apparently be a night at the Barrymore, which used to be the "kickoff" for BobFest, but with no Bobfest to "kickoff" not sure what the point is. Not only that, it is scheduled for September 10th and there is zero information available regarding the event available anywhere. A quick look at the FightingBob Facebook page and all you see is a months old post by The Progressive Magazine asking for money. Since Hillary and her team blew it in Wisconsin and allowed the Donald to become President and RoJo to beat Senator Feingold, among many other losses, let us take a look at the Democratic/liberal/progressive scorecard n WI. * Progressive Talk, The Mic 92.1, ended their run of political talk, despite good ratings, and went to a classic rock station(which I hope none of my readers will ever listen too). * Sly was removed from his afternoon Progressive talk show and just allowed to play music on his family of radio stations. * The Progressive magazine, has went from a monthly magazine to a bimonthly magazine. * Wisdems leadership did not change and neither did anything in Wisconsin Democratic party. * The Wisdems communications director left and no one knew(think about that). * The Democratic Minority leader of the Assembly, voted YES to give FoxConn $3 Billion taxpayer dollars to maybe create a few thousand jobs. Was quickly congratulated by Scott Walker. * Senator Dave Hansen life was threatened, Rep. Joel Kleefisch hung out with an anti-government hate group and there was a huge white supremacist march, which was handled poorly by pretty much every GOP rep(but Jim Steineke) and not a peep from the party. * Paul Ryan feels comfortable enough to go on live TV and talk about how great a job The Donald is doing. * FightingBob Fest has been shut down. * The one Progressive media outlet in the State, The Capital Times, used to associate with BobFest, but now has decided to start its own "fest" called ideasfest where they invite people from "all sides" to share ideas, or as they bill it - a new way to reach a better state. Under the leadership of managing editor Chris Murphy, these talks have posed what we believe are timely questions: “How many new apartments does Madison need?” was one well-attended example last year. We convened a panel of experts that drew almost 300 spectators to the High Noon Saloon, one of our frequent venues. Topics have varied but the turnouts, even on bad-weather weeknights, have been impressive — often 200 people or more. This new Idea Fest takes that concept — that people appreciate well-crafted experiences that both educate and entertain — and builds something much bigger. While the inaugural fest coincides with the 100th anniversary of the Cap Times, it will be an annual event and not a one-time celebration. The people sharing their "ideas" are such noted thinkers as Charley Sykes and Ron Johnson. I look forward to hearing about the dangers of sunspots and why we should all call Michelle Obama - Mooch. Those are some brilliant "ideas". Might I recommend they also invite Wild Bill Kramer to give us ideas on how to treat women and Scott Walker to tell us how to arrest people who sing songs you do not like. The ideas that some in this state can share with us are endless. (Edit note: The venue for this "ideas fest" will be the UW-Madison campus. I wonder if Robin Vos and Jesse Kremer needed to sign off on all speakers and topics). I guess when you have a director, Brady Williamson, who also represents WMC, then you should expect that the Progressive tradition of the Cap Times would be watered down. Not much momentum heading into the incredibly important election of 2018 in Wisconsin for team blue(and rumors of internal dissension within the party - more on that coming)! There is a zero sense of urgency, heading into a Gubernatorial election season, where historically the GOP should be extremely vulnerable. At least I should say, that with rare exceptions, there seems to be no sense of urgency, because it seems like the WISDEMS have been on vacation this year. We also have another problem to overcome. primaries. There are going to be many people jumping in the race to face Scooter, the guy who thinks walling off Canada is a good idea. There is also a very contested race between Randy Bryce and Cathy Meyers to take on Paul Ryan already and a three way race for Supreme Court. All of these races have been ugly already and we are only getting warmed up. Some people who I respect tremendously, who played neutral in the last presidential race, have been saying nasty things and spewing too much venom at candidates that they do not support,. So with all of the complete suppression of Progressive values, Ed Garvey is truly dead to us in WI! One of my favorite sayings of Ed's was "Is this a private fight, or can anyone join in?". It is time that we honor Ed Garvey again and start to take back our State. Just like then, we need to take back the Democratic Party and then the State! We need to do it IMMEDIATELY! How do we do that at this point in our History? It is simple, the same thing any athlete does when they fall into a bad slump - Go back to the basics! Preservation of local fiscal control to prevent arbitrary and centralized budget limits on local units of government. It is hard to believe that we need to work around our legislators, to come up with these four basic ideas for a platform. That we have to push the Democratic Party to support these basic fundamentals, but we do. Let's honor the memory of Ed Garvey and DEMAND that these basic principles are not just part of the platform of any candidate asking for our support but that they also make them part of their stump speech! We have to also respect EVERYONE that runs for office, even if you do not support them. The way we attack people who are not part of the Democratic Party establishment is beyond the pale and needs to stop. We also have to welcome ALL people into the Dem party and stop putting a premium on the people who pay $20. We need every vote we can muster in November 2018 and if it means someone has to give up some of their power so be it. "Bring your brooms so we can sweep the lobbyists out of the Capitol"
Ed Garvey showed us the way to a better state....let us honor his memory and actually bring real change to Wisconsin!